This cake is reserved for coconut enthusiasts and very special occasions. I say that because it is a major project that requires some serious love and determination. However, it is THE MOST AMAZING coconut cake that I have ever tasted! So, if you are up for an adventurous day of baking, this recipe is definitely worthwhile. I saw Alton Brown prepare this cake on Good Eats a few months ago and at that time decided to make it for John’s birthday. My friend Jolene came to visit for John’s birthday weekend (it was her birthday too) and wasn’t surprised when I mentioned that I had all the ingredients and plans to make a coconut cake from fresh coconuts. She knows me well and during the labor of love mentioned that she actually expected that we would be baking something unique and challenging. That morning, we woke up and immediately got to work. We drilled, drained, baked, cracked, peeled, sliced, shredded, soaked, and toasted coconut. We frequently stopped for a moment to indulge in the amazing smells and tastes of the fresh coconut. What an incredible food! Jolene and I took a short break for lunch and then continued our baking. It was 7pm by the time we threw the toasted coconut on the frosted cake and marveled at our beautiful creation. So beautiful and laborious that we decided it deserved a name, and Casper seemed appropriate. Fortunately, we had an eager group of brunch eaters join us the next day to celebrate John’s birthday and indulge in this decadent cake. It was really fun to share the cake and talk about the process. If you have the time and energy to make this cake one day, just once, you won’t regret it. Drill holes in the eyes of the coconuts and drain and reserve the coconut water. Place the coconuts on a baking sheet and place in the oven until they crack in mutiple places, approximately 15-25 minutes. Remove coconuts from oven (turn oven off) and pry off shells with a scredriver or oyster knife. Peel brown skin off of coconuts with vegetable peeler. Rinse the coconut meat with cool water. Pat dry and break into 3 inch pieces. Grate coconut meet in a food processor, set aside. Pour milk into saucepan and heat until just boiling. Place 6 ounces of the grated coconut (approx. 3/4 cup) in a bowl. Stir the hot milk into the coconut, cover tightly and allow to sit for 1 hour. Meanwhile, prepare 2 9-inch round cake pans by lining the bottoms with parchment paper and then oiling and flouring the pans, set aside. Place 8 ounces of the shredded coconut on a baking sheet, spread evenly, and toast in the oven as it is pre-heating. Watch carefully to make sure that it doesn’t burn. Remove coconut from oven and allow to cool on pan. Whisk together the flour, baking powder and salt in a large bowl, set aside. Beat the butter in a stand mixer with the paddle attachment on medium speed for 1 minute. Decrease the speed to low and add the sugar gradually. Turn the mixer back up to medium speed and beat until light and fluffy, approximately 3 minutes. Stir in the coconut extract, set aside. Use cheesecloth to strain the milk from the shredded coconut, reserving 1 cup of the milk for the recipe. With the mixer on low speed, add the flour alternating with the milk in three batches until just mixed. In a seperate bowl, whisk the egg whites until they form stiff peaks. Fold the egg whites into the batter, until just combined. Divide the batter evenly between the pans and tap them on the counter to remove any air bubbles. Bake for 30-40 minutes or until the cakes are light golden. Cool the cakes in the pans for 10 minutes, then transfer to a cooling rack. Once the cakes have cooled completely, cut across the equator of each to form 4 layers. Place 1/4 cup of the coconut water in a spray bottle or apply with a pastry brush to the cut sides of the cakes. Stir the egg whites, sugar, coconut water, cream of tarter and salt together in a medium bowl. Remove from heat and beat in the coconut and vanilla extracts. Allow the frosting to sit for at least 5 minutes before using (if it will be sitting for a while, put it in the refrigerator). 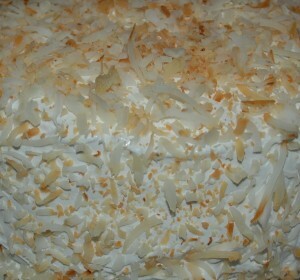 Place approximately 3/4 cup of the frosting on the first layer of the cake and sprinkle with the fresh coconut. Repeat process until you reach the top layer. Frost the top and sides of the cake and sprinkle (or throw) on the toasted coconut. This entry was posted on Wednesday, January 28th, 2009 at 3:14 pm	and is filed under Cakes. You can follow any responses to this entry through the RSS 2.0 feed. You can leave a response, or trackback from your own site. Mmmmmm… Casper was the most amazing cake ever! He was definitely worth a once time labor of love. 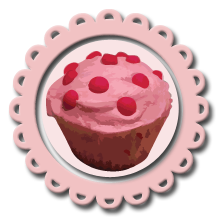 You should also consider the Barefoot Contessa’s coconut cake and cupcake recipes. If you ever try those, just don’t use the sweetened coconut as the recipes suggest. That makes it way too overwhelmingly sweet. I looooove coconut. yum yum yum yum. So did you use the grater blade on the food processor? I assume its functional now?